Here in Los Angeles and cities across America, some students are heading back to school and others don't start until after Labor Day. The latter have a couple more weeks of freedom to explore their interests, daydream, or design the Minecraft house of their dreams. Here at KitHub, we believe that kids should be free to follow their interests no matter what time of year it is, and especially at school. That's why we designed our hands-on STEAM kits, so whether students' interests lie in art, electronics or science, something about the project is bound to pique their interest AND we made it really easy for an educator to facilitate the projects. I've used this kit with students as young as 4.5 y/o and students in upper elementary (gr. 3-5) and it has served me well. I'm not a trained engineer, nor did I major in the STEM fields and I can successfully teach an inquiry-based lesson that discusses the very basics of electrical engineering and circuits thanks to the excellent, detailed lesson plan provided. Open The Box And Go! Introducing science and technology into the classroom can be challenging, especially if you are limited by time and budget. All of our kits come with student instruction cards, lesson plans and printables, so all you as an educator have to do is open the box, handout the pre-packed part bags* and instructions cards to the students, and follow the lesson plan. The projects are open-ended, so if you want to associate a project with a theme, or encourage your students to do something completely different with the materials, that's A-OK! Whether you want a single session project or 10 weeks of hands-on activities, we have a kit to match your budget and schedule. Don't forget! Save 10% off any of our STEAM Kits during the KitHub Back To School Sale. Hurry, the sale ends on August 31st, 2017. Use code: BACKTOSCHOOL10. * Note: The STEAM and Maker Program kits come with art materials. The Motorized ﻿ArtBot﻿ kit requires you to provide paper cups and the Paper Circuit Kit requires you to provide paper. 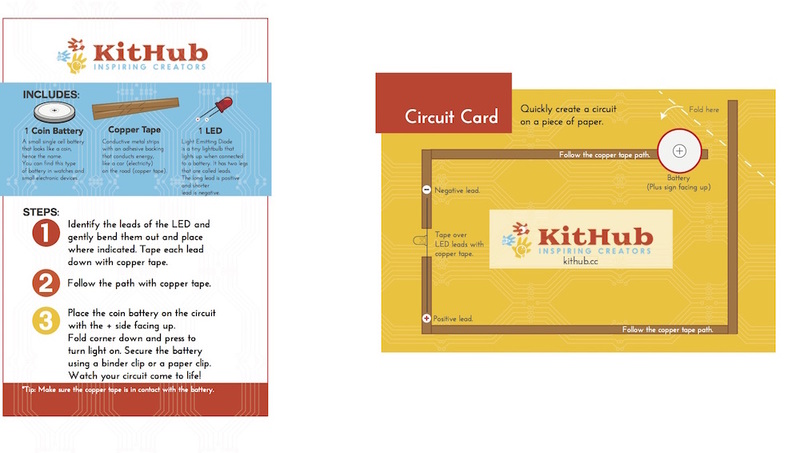 If you have any questions about our kits, or want to place a Purchase Order, please email hello@kithub.cc. Use code BACKTOSCHOOL10 at checkout and receive 10% off any of our STEAM Classroom and Program Kits.